Medium-Duty 450kg S.W.L.1.3m Width. 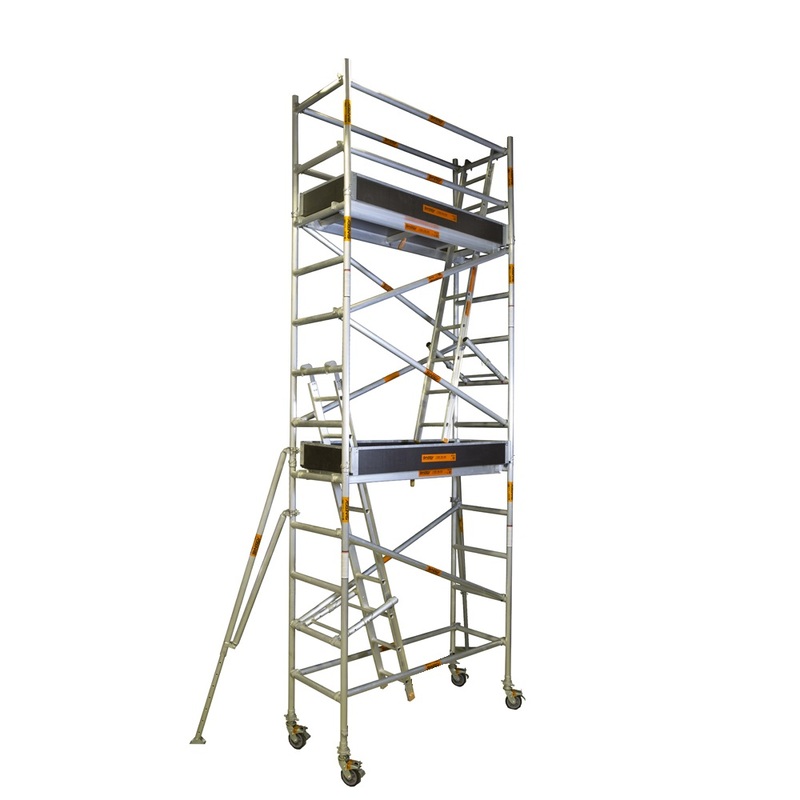 We are Australia’s leading manufacturer and distributor of scaffolding and access equipment. 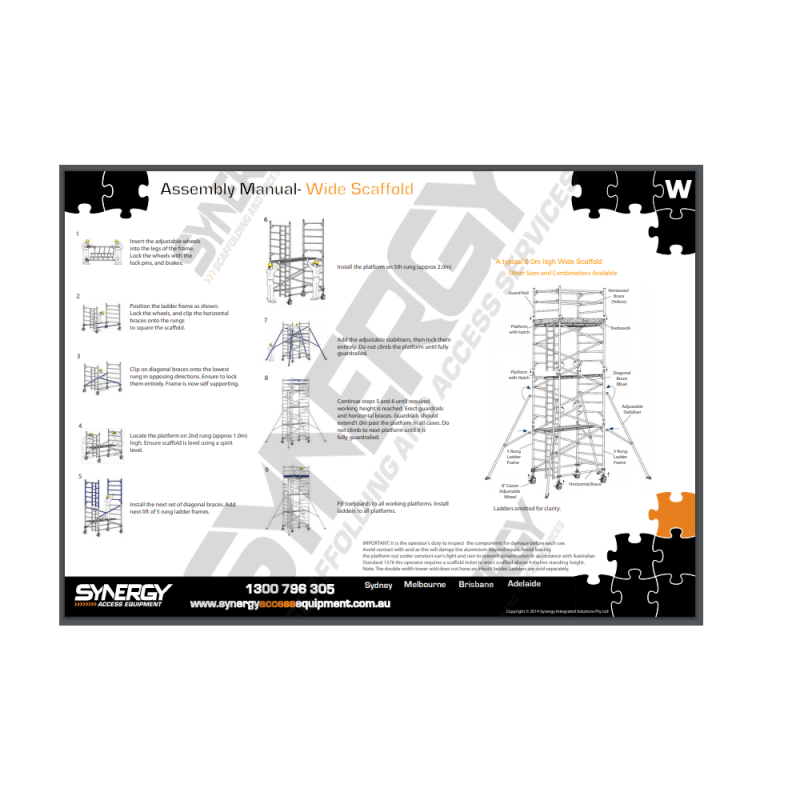 Synergy aluminium mobile wide scaffold contains lightweight components which allows easy assembly and transport. 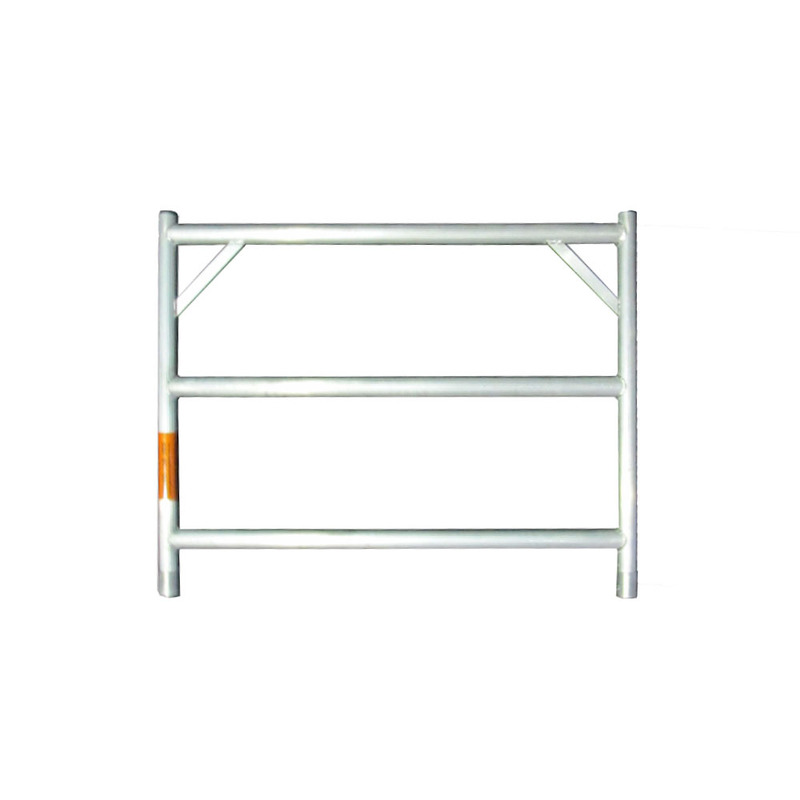 Complete with Work Cover NSW certification means this scaffold can be used in domestic and commercial fields. More suited for residential, commercial and industrial sites. 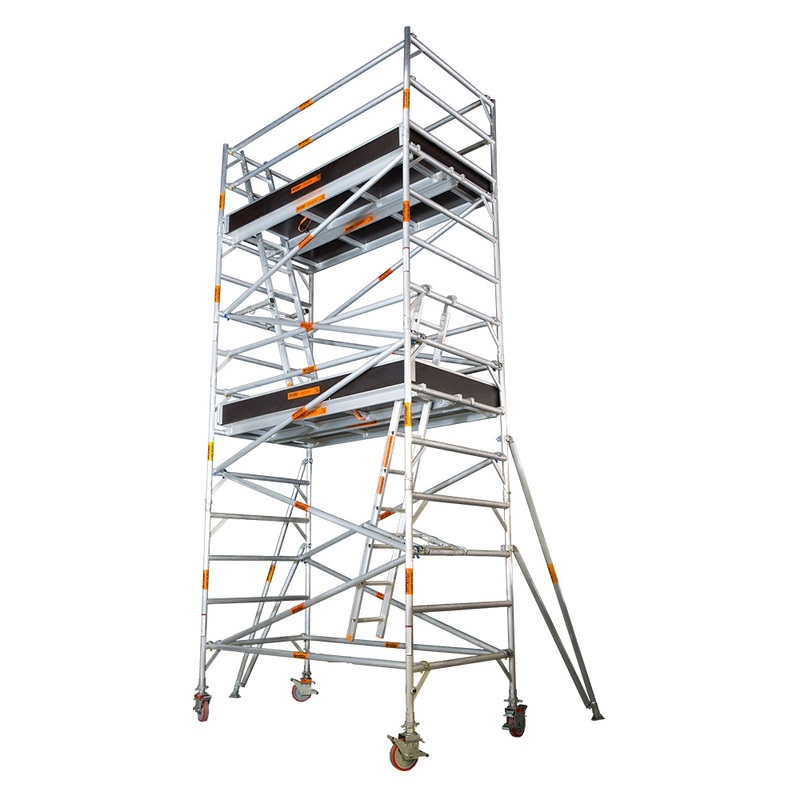 Workcover certifies double width mobile scaffolds without support to a maximum height of 5m. 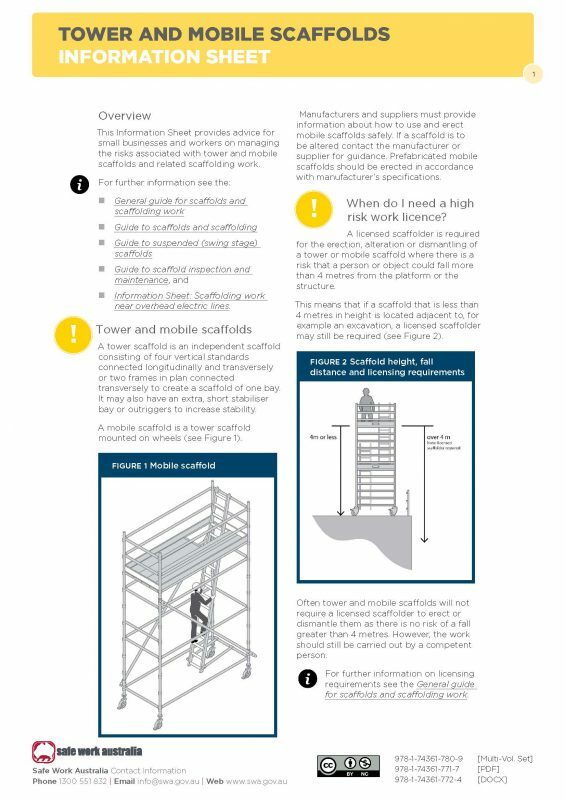 Mobile scaffolds over 5m require outriggers by law which must be positioned to maintain a height to minimum base width ratio of 3:1 the height of towers with a base width less than 1.2m should not exceed twice least base dimensions. 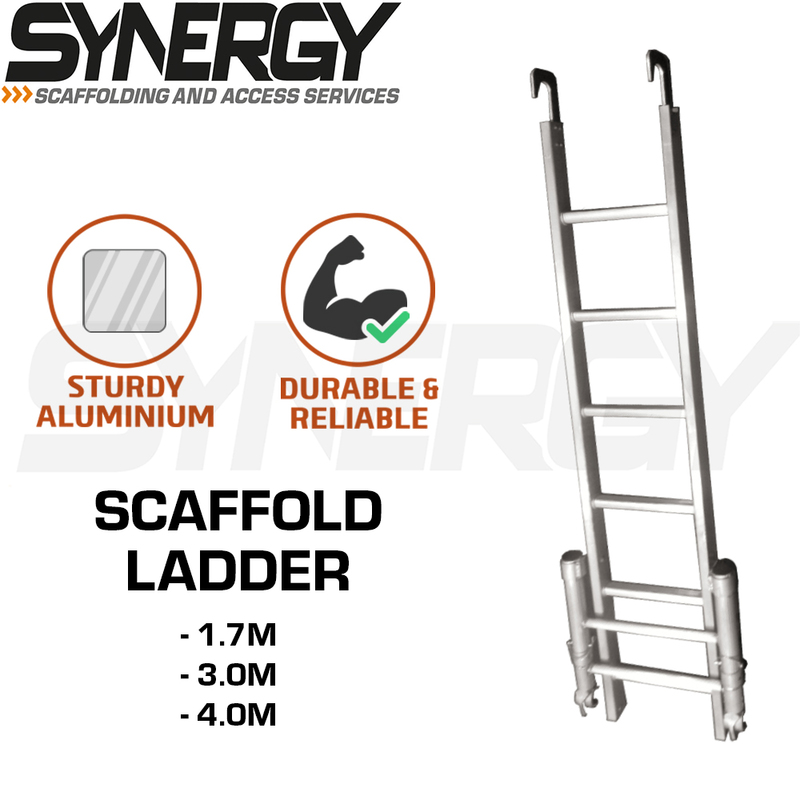 Synergy’s 5 rung wide ladder frame is made from durable and weather resistant aluminium tubing with a tube wall thickness of 2mm. It has an overall height of 1995mm, width of 1300mm (outside to outside) with the rung interval spacing at 400mm apart. The top end of the frame has a spigot which allows for frames to be inserted into the spigot ensuring a quick connect. 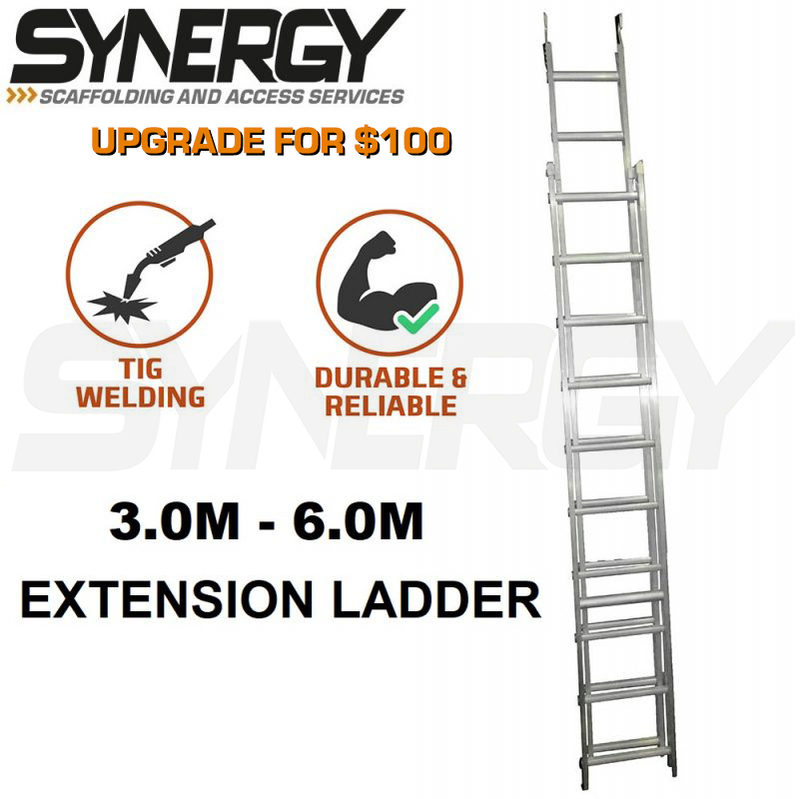 Synergy’s 3 rung wide ladder frame is made from durable and weather resistant aluminium tubing with a tube wall thickness of 2mm. 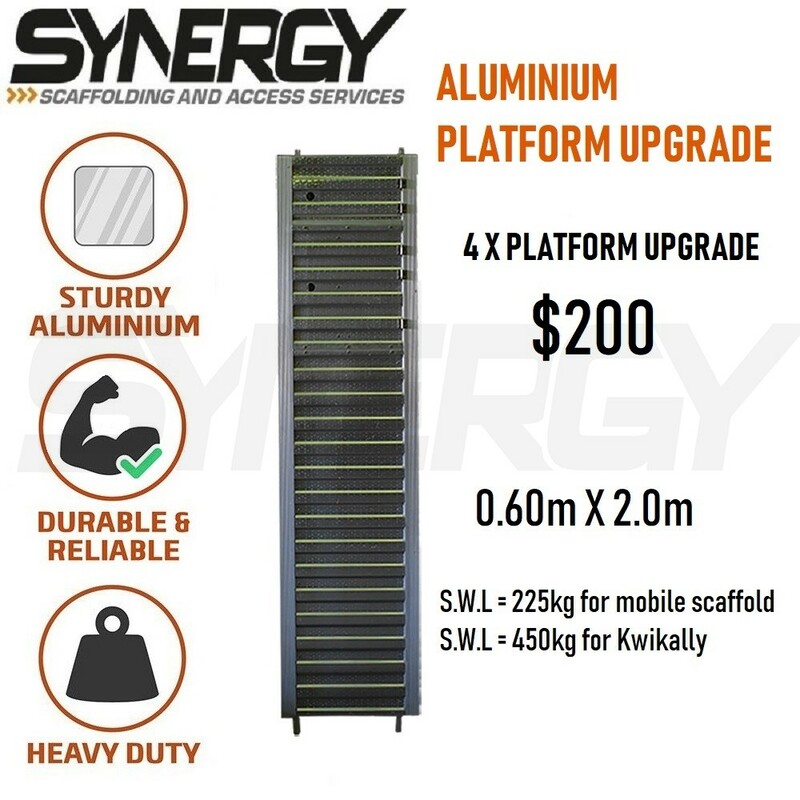 Synergy’s guard rail frame is made from durable and weather resistant aluminium tubing with a tube wall thickness of 2mm. 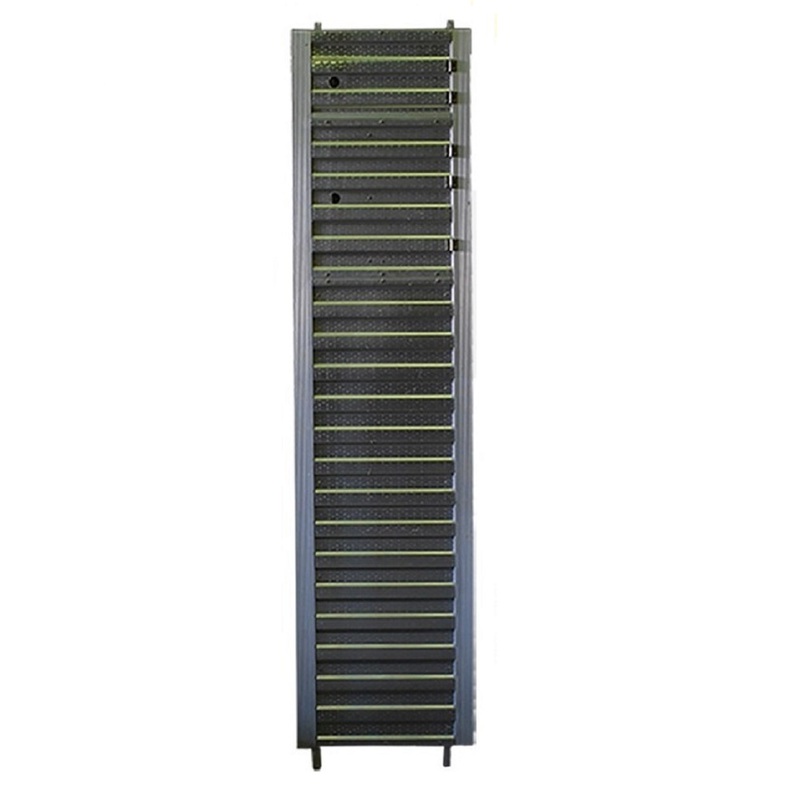 It has an overall height of 1000mm, width of 1300mm (outside to outside) with the rung interval spacing at 400mm apart. The top end of the frame has a closed end cap. 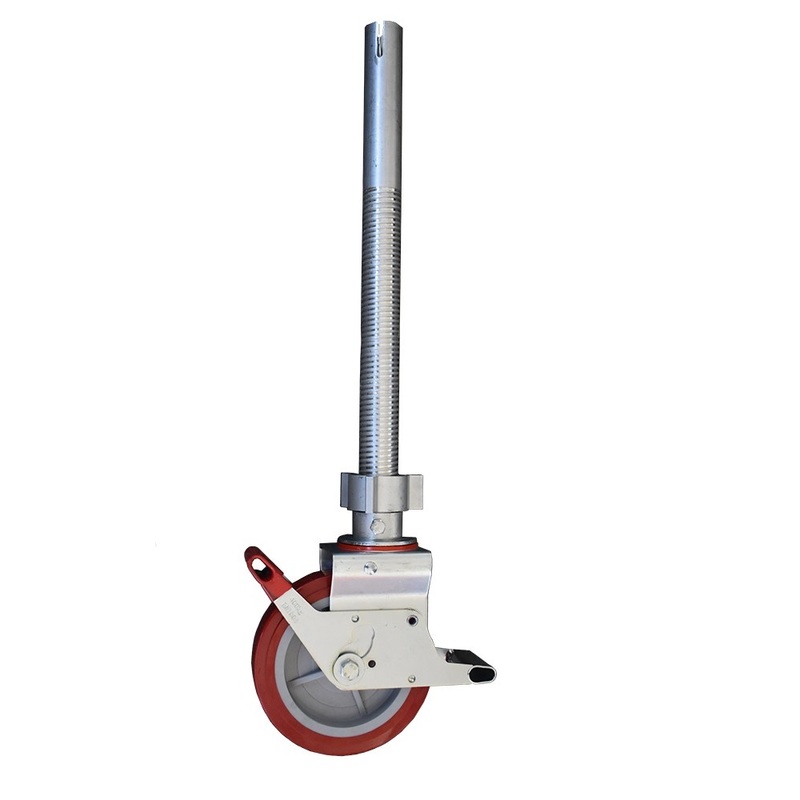 The 8-inch mobile scaffold polyurethane wheel features a 600mm Threaded Shaft with (400mm Adjustment). Fitted with a foot brake to prevent rolling and swivelling movement and a turning mechanism to provide an adjustment of 400mm, they are suitable for both internal and external use. Our platform suitable for the 2.0m long mobile scaffold is manufactured from marine grade plywood and is 1883mm long from centre to centre. 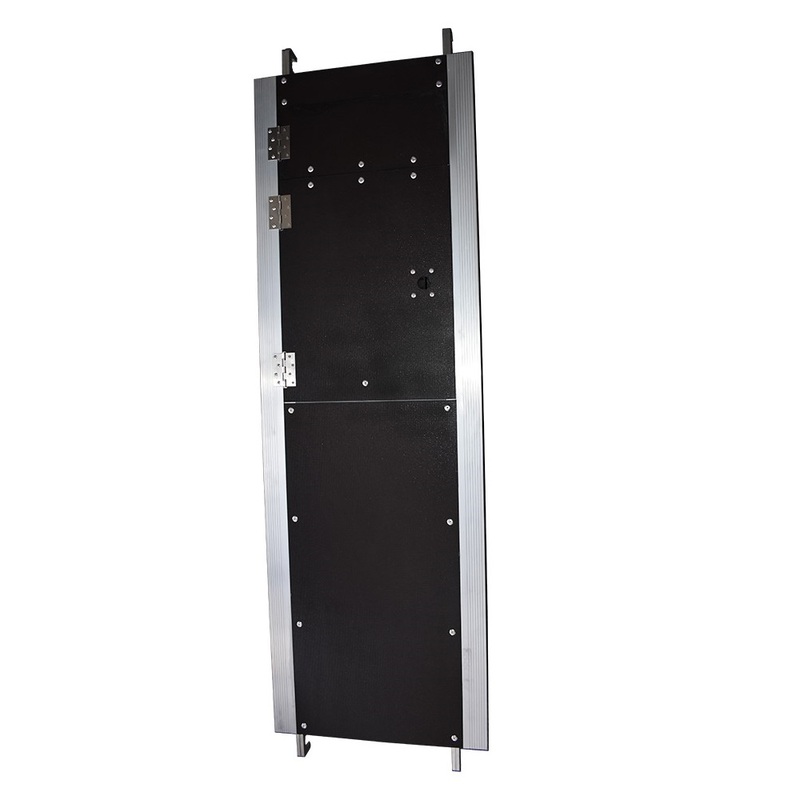 It features an easy-lift hatch which allows for access between levels while ensuring the worker is safe. 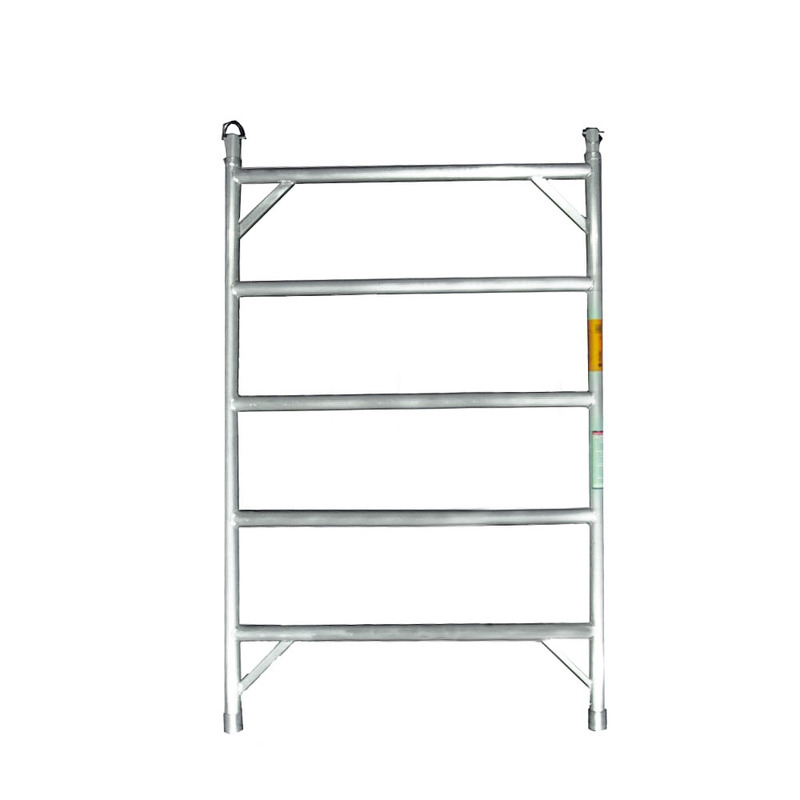 Our horizontal brace suitable for the 2.0m long scaffold is precisely 1884mm long. 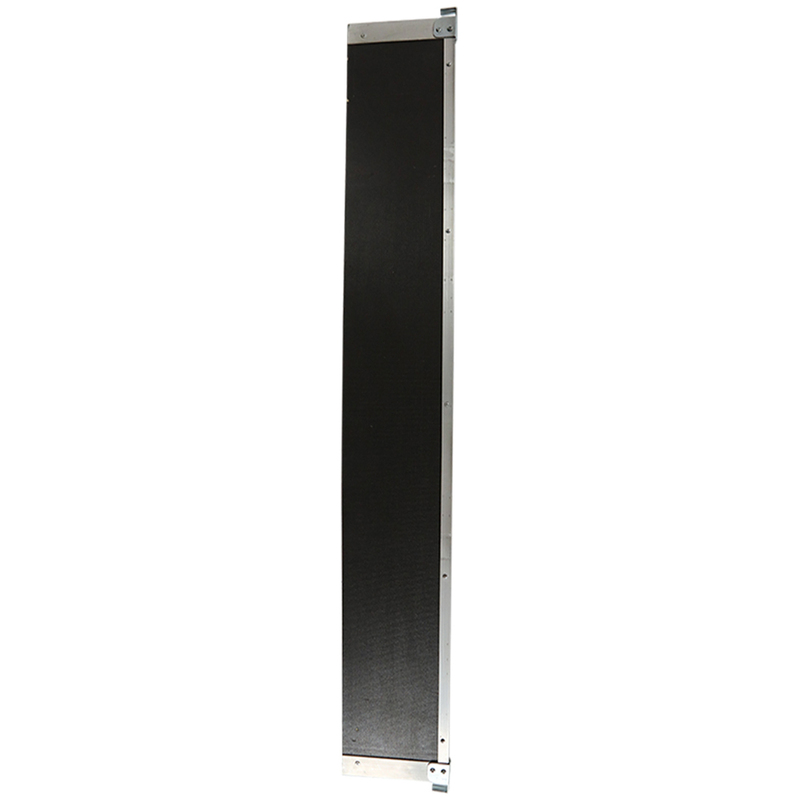 The brace is manufactured from certified structural grade aluminium tubing. The ends of the brace are riveted. 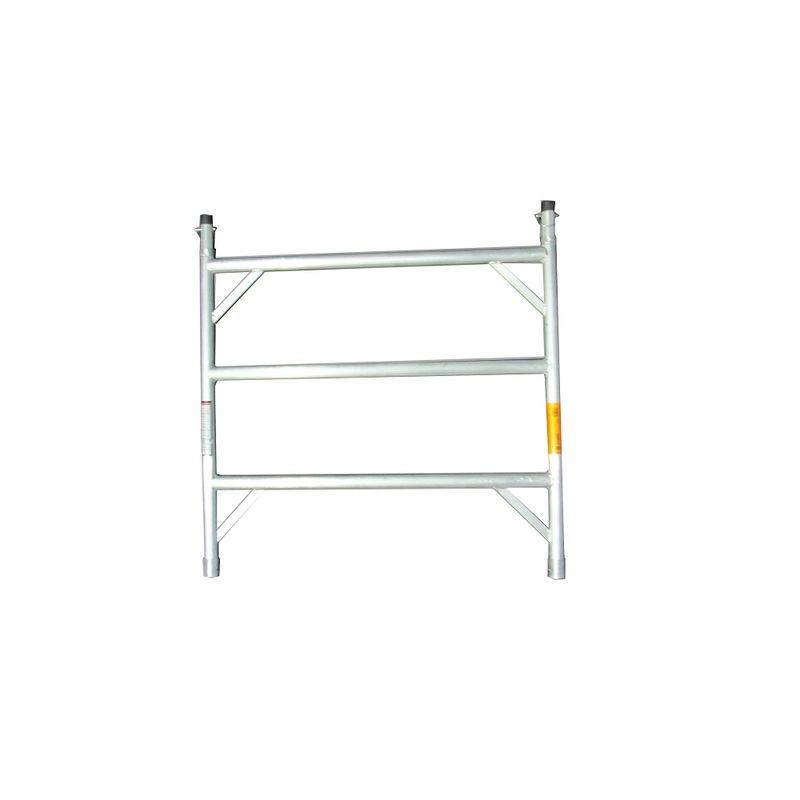 Our horizontal brace suitable for the 2.0m long scaffold is precisely 2000mm long. 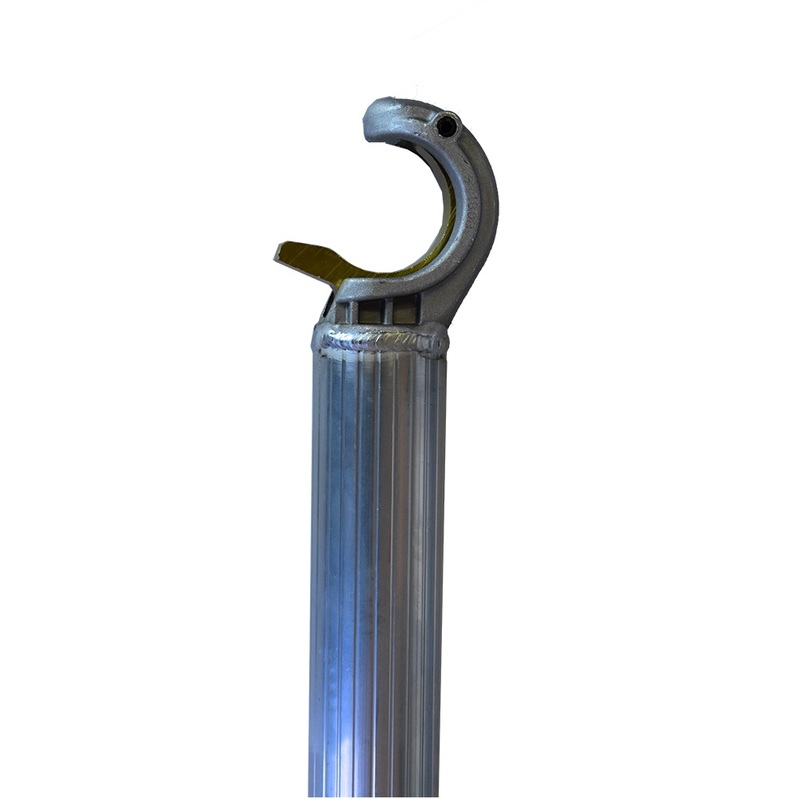 The brace is manufactured from certified structural grade aluminium tubing. The ends of the brace are riveted. 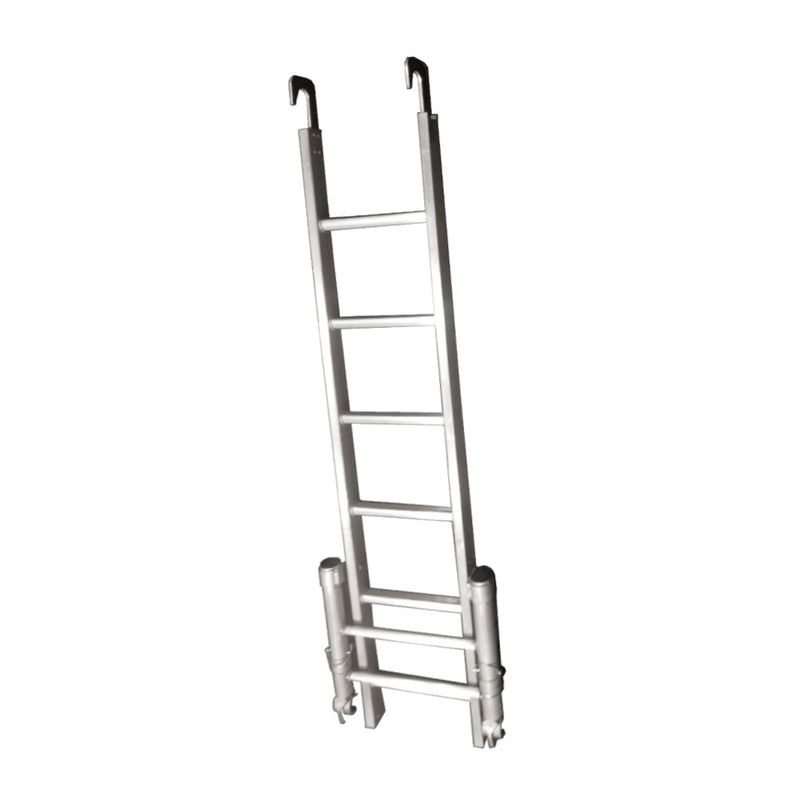 Our 3000mm Aluminium Ladder features a brace to secure the ladder at any angle and hooks to rest on the scaffold ladder frame rungs. 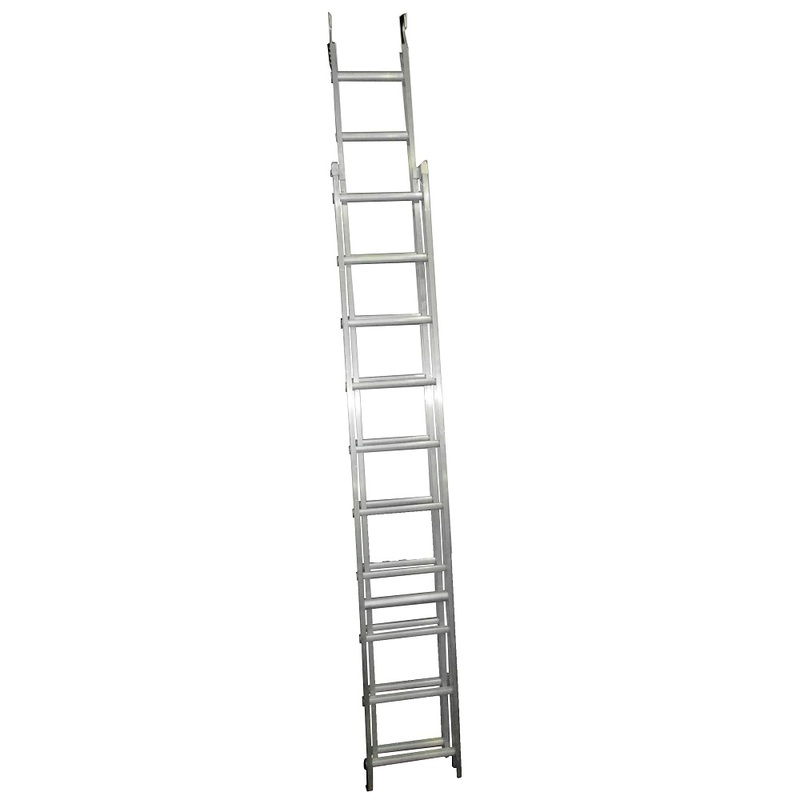 Our 4000mm Aluminium Ladder features a brace to secure the ladder at any angle and hooks to rest on the scaffold ladder frame rungs. 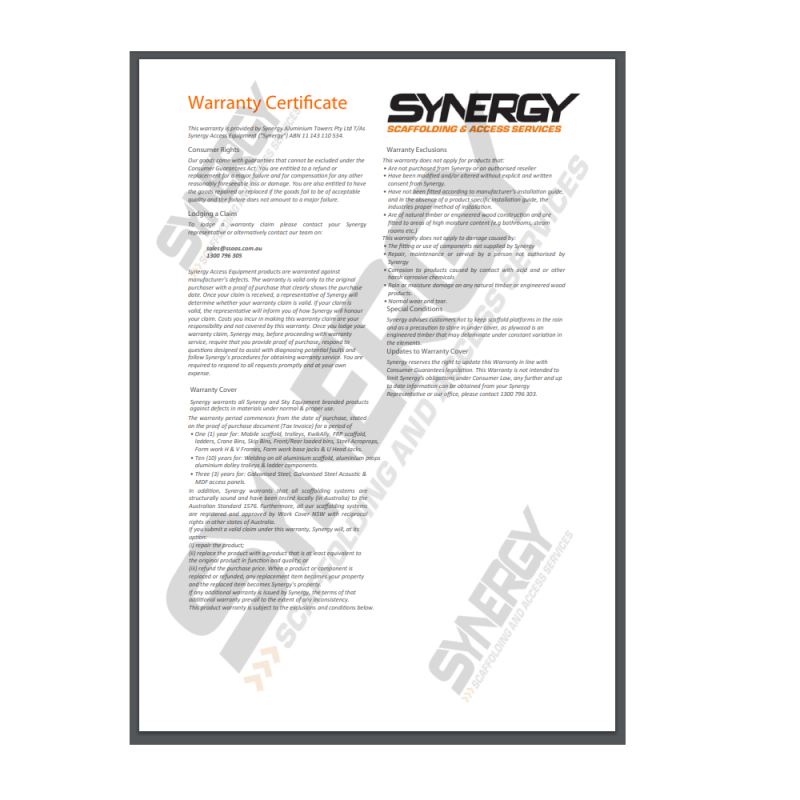 Synergy’s Toeboards are made of plywood material and are designed for an easy and secure fit. 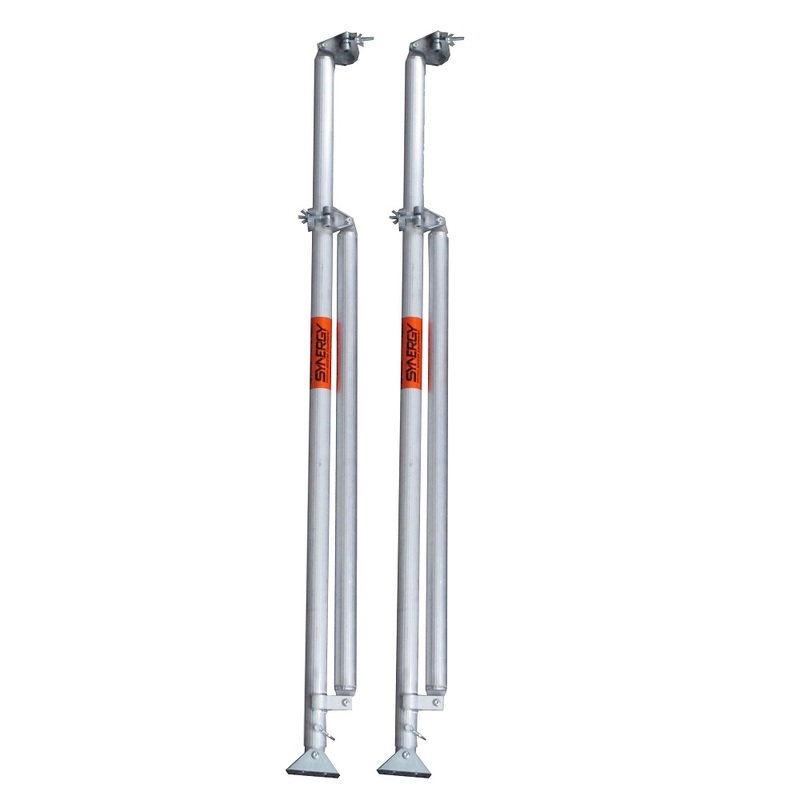 Our stabilizers have two arms which attach onto the scaffold using a swivel coupler to prevent it from rocking. The leg of the stabilizer allows the user to adjust the range depending on what is required. It can be used in any situation. It also includes a swivel foot with rubber sole for extra stability. Please view the images below to give you a rough idea of how your order gets packed and delivered.